Each year, MADD (Mothers Against Drunk Driving) New Mexico honors individuals who have proven to be heroes in the fight to end DWI, support victims of this violent crime, and prevent underage drinking. The 2014 Honoring Heroes awardees include winners from the business sector, the courts, everyday citizens, one teen, and members of law enforcement. Officer Chris Blea with the Farmington Police Department’s Traffic Division is among this year’s 10 winners. 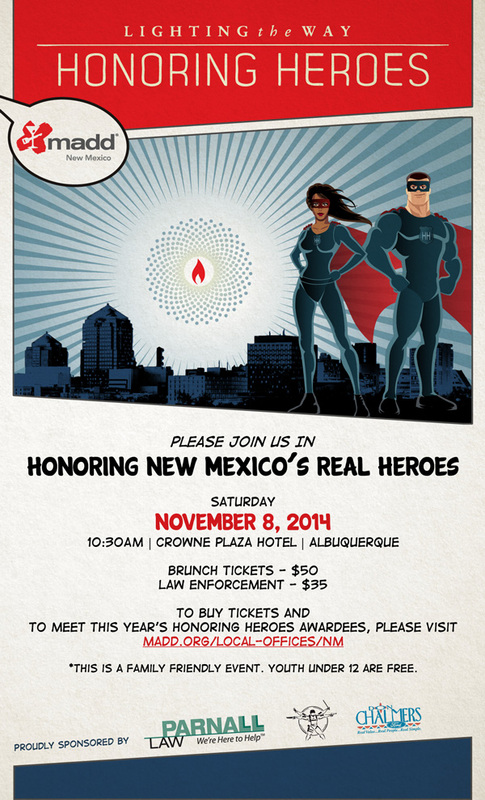 These heroic individuals will be celebrated this Saturday, November 8 during a brunch at the Crowne Plaza Hotel in Albuquerque. I would like to nominate Officer Christopher Blea of the Farmington Police Department for the 2014 Honoring Heroes Award. Officer Blea has been with the department since 2010. Prior to his employment with the agency, Officer Blea worked in Los Lunas, NM as a police officer since 2007. Officer Blea was assigned to FPD’s DWI Taskforce for two years and is currently assigned to the Traffic Division. During his time in the DWI Taskforce, he was recognized as officer of the year 2012, for his commitment in reducing the number of impaired drivers on our roadways. In this year alone, he affected 112 DWI arrests. Throughout his tenure with FPD, he has arrested 227 offenders for DWI, saving countless lives in our community. He takes an active role in the prosecution of his cases seeing each case through its completion. Officer Blea is a Standardized Field Sobriety Test instructor. He is exceptionally knowledgably in the field and has always received nothing but positive feedback from the students he instructs. Officer Blea is also a Drug Recognition Expert (DRE) and instructor in this field. He has currently completed 62 evaluations of offenders arrested for driving under the influence of drugs. Officer Blea has instructed three DRE schools. The DRE school consists of an extensive two week classroom session followed by an additional week of practical training. Officer Blea selflessly extends his knowledge to surrounding agencies in our community by conducting DRE evaluations, assisting their DWI investigations. Officer Blea has taken the initiative to make mandatory requirement that every officer employed by FPD, complete the Advanced Roadside Impaired Driving Enforcement (ARIDE) Program. Due to the rising number of drug impaired drivers on the roadways, he took personal responsibility to provide our officers with the proper training to identify the signs and symptoms of impaired driving. Officer Blea has instructed seven ARIDE courses and is teaching another scheduled class in September. During the 2013 holiday season, Officer Blea submitted a holiday enforcement tactical plan, “Home for the Holidays.” The objective was to keep the community safe by reducing the number of injuries, deaths, and amount of property damage created by impaired drivers. FPD’s DWI Taskforce conducted aggressive DWI enforcement during the holiday season as there are statistically higher numbers of impaired drivers and alcohol related crashes during this time of year. At the completion of this project, Officer Blea provided a statistical analysis summarizing the data generated from the “Home for the Holidays” assignment. Outside the scope of his traditional duties in his current assignment, Officer Blea volunteers his time, monthly, to the San Juan County Victim Impact Panel. During this time, he provides an educational presentation to individuals who are currently involved in the legal system, typically stemming from a DWI charge. Officer Blea is compassionate about ending DWI and this is reflected in the service he provides our community. He takes an active role in the battle against impaired drivers from education to enforcement. Officer Blea’s passion, training, and experiences are invaluable assets to FPD and the community. Therfore, he merits the recognition fo this hero award.